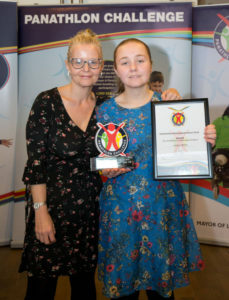 Harry Bowtell was among the prize winners as Panathlon’s finest young leaders and participants were honoured at Friday’s Jack Petchey Outstanding Achievement awards. The awards are now in their 10th year and the ceremony at John Lewis Stratford, overlooking the magnificent Queen Elizabeth II Olympic Park, celebrates our finest Panathletes and young leaders from across London and Essex. James Hillier went away with the blue riband Outstanding Achiever award, with Kinza Yasin and Piravien Chandrarajan picking up Highly Commended awards from the Jack Petchey Foundation judges. Read all about them here. In the other prize categories, Harry Bowtell from Brentwood capped six years of progress from athlete to official by collecting the Sporting Achievement prize. Harry is a familiar figure at Panathlon competitions across London and Essex. The 17-year-old business studies student with complex physical and learning needs was diagnosed with cerebral palsy at just seven months old. He is vision impaired due to nystagmus and wears special glasses to help his sight, as well as being on the Autistic spectrum. He discovered boccia through Panathlon in 2012 and quickly developed a passion for the precision ball game that led him to captain his school team to gold in the Plate competition at the Copper Box Arena in London’s Olympic Park in 2016. He was named runner-up in the Jack Petchey Outstanding Achievement award category that year. After honing his skills at Hall Mead School and then Havering College, Harry achieved his Boccia Level 1 officials course and refereed the Lord’s Taverners National Schools Boccia Finals in Hatfield in April this year. He now delivers boccia training sessions in primary schools, helping children with special educational needs learn to play the sport, while also working as a volunteer with Panathlon. Harry’s rapid ascent from beginner to coach and his excellence in playing, leading and promoting the sport made him a fully-deserving winner of the award. 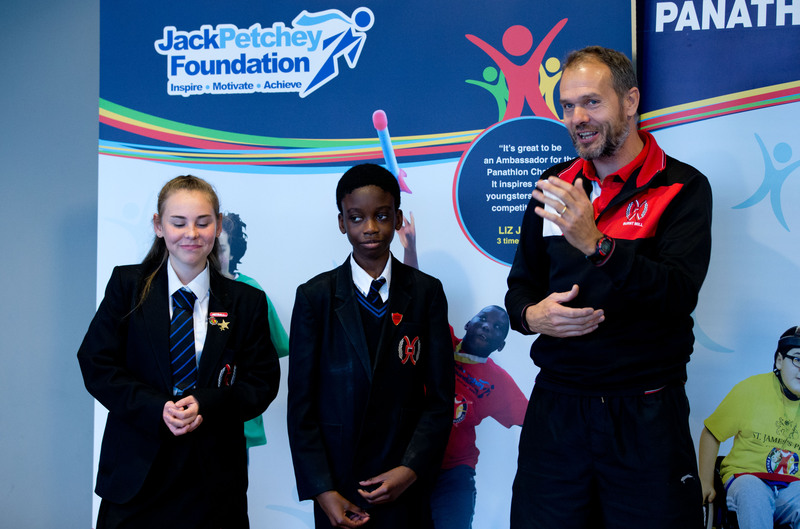 The remarkable sporting journey of 17-year-old Jessica White, of Trinity School in the London Borough of Barking and Dagenham, was recognised by the Jack Petchey Foundation judges with the Sport and Leadership Award. From arriving at Trinity in September 2006 with no speech and unable to take part in activities independently, she went on to overcome her communication problems and became a leading student who was named the school’s Head Girl this year. Sport played a key role Jessica’s transformation and she too has nurtured a keen interest in boccia, developing game-specific skills and leadership qualities that have brought success to the school. She represented Trinity at the Panathlon boccia competition and performed superbly, helping her team to a series of victories. Jessica, from Romford (pictured above with her mum), is also a TEACCH (Treatment and Education of Autistic and related Communication Handicapped Children) Trainer, assisting school staff in the use of structured teaching methods, and a member of extra-curricular dance, badminton and Panathlon clubs. Jessica’s teacher Danielle Hawkins, Head of PE at Trinity School, said: “She has overcome so many barriers. Her attention to detail is incredible, she’s proactive in her approach and she’s one of the kindest people in our school. 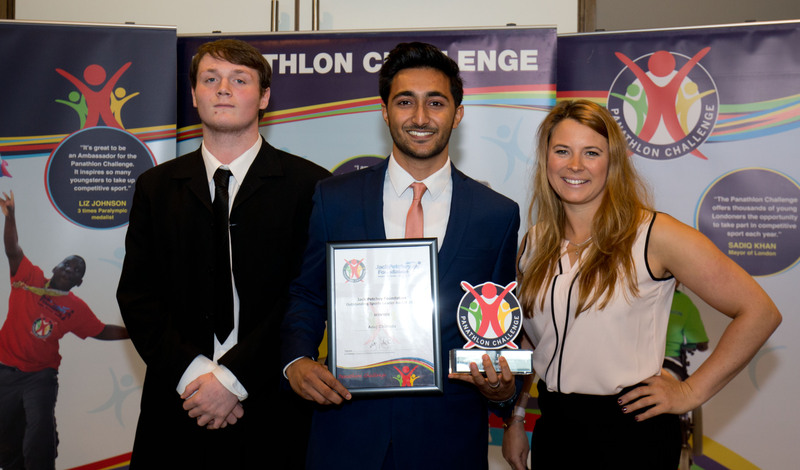 The Young Leader Award was presented to 18-year-old Anuj Chitroda, who organised a Sport Relief day for over 2,000 pupils and raised more than £1,300 for the charity in the same year that he completed his Sports Leaders UK Level 3 qualification. 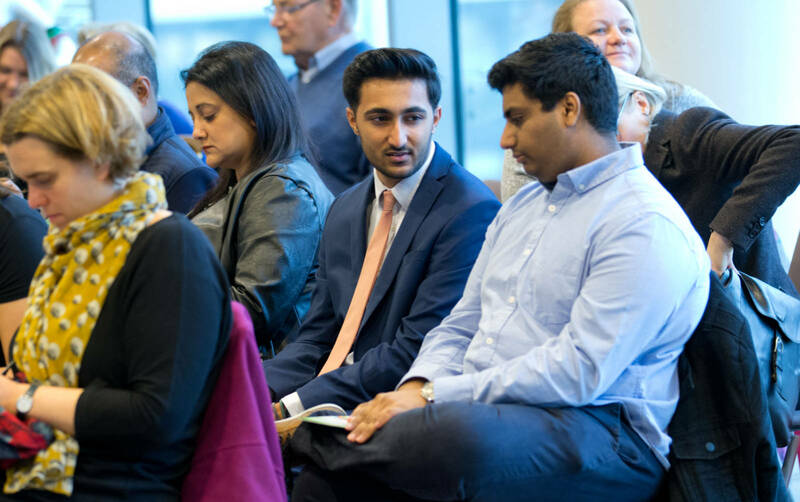 Anuj established himself as an outstanding sports leader during his time at Kingsbury High School in north-west London and he moved onto college at the end of a year packed with achievements. He now studies computing at De Montfort University in Leicester. He officiated at three Panathlon swimming events and showed confidence and skill, assisting participants in the pool in a manner that set them at ease and helped to bring the best out in everyone involved. “It was really interesting how to adapt games to suit the children and make sure everything was having a good time. Before you’ve tried it you don’t realise what skills are needed but being thrown in at the deep end is the best way. This inaugural award was given to Burnt Mill Academy Trust – four secondary schools and five primaries all based in Harlow, Essex. Burnt Mill only joined the ‘Panathlon family’ in 2017/18 and have provided Young Leaders in several competitions. Panathlon events have greatly augmented the skills of pupils on their leadership programmes, some of whom have special educational needs themselves. After being trained up by Panathlon COO Tony Waymouth, staff and students were given the opportunity to officiate and assist competitors at the East of England Multisports Final in February, the Essex Primary Swimming Final at the London Aquatics Centre and the East Region Deaf Boccia Final. 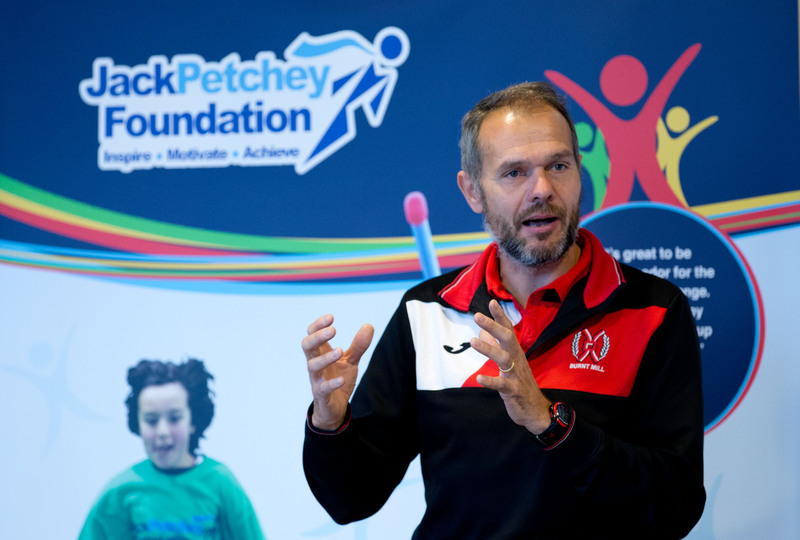 “Working with the children has been brilliant for them,” said Director of Sport, Phil Dawes (pictured above). “It helps them develop, seeing all kinds of different needs people have and how to deal with them up-close. It teaches them to treat people with disabilities normally, rather than differently. 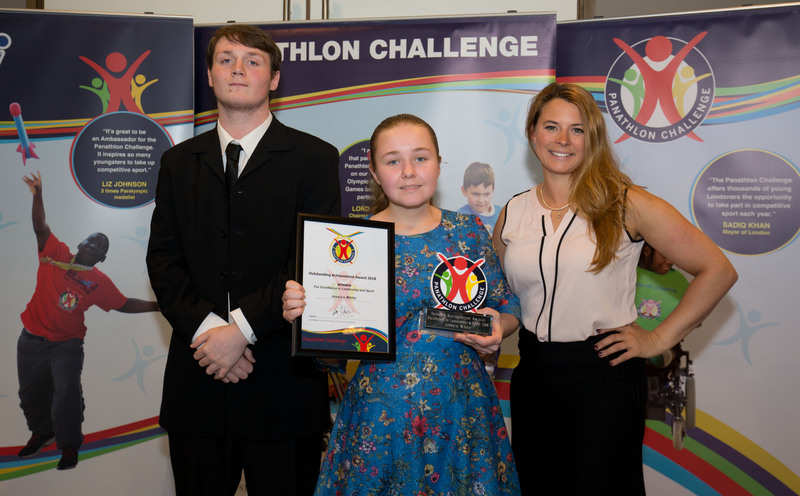 The prizes on the day were presented by Panathlon Ambassador Liz Johnson, the Paralympic gold medallist swimmer, Jack Petchey Foundation’s Operations Director Gemma Juma and special guest Matthew Key. Liz (left) said: “Young Leaders are integral to Panathlon’s incredible impact. They have such a good temperament, understanding of the rules and the needs of the youngsters taking part. Thank you also to our very generous hosts, John Lewis Stratford City.